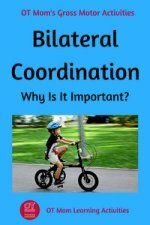 Use these simple bilateral integration activities at home to help develop your child's coordination skills! Your child will usually learn to coordinate the use of the arms before the use of the legs, and obviously, the hardest thing is to use the arms and legs together in a coordinated way at the same time (such as jumping jacks). So keep that in mind as you try the following activities! Most importantly, have fun with your child! The activities on this page are intended to support your child's normal development. If you are at all concerned about your child's skills, please consult your health professional! 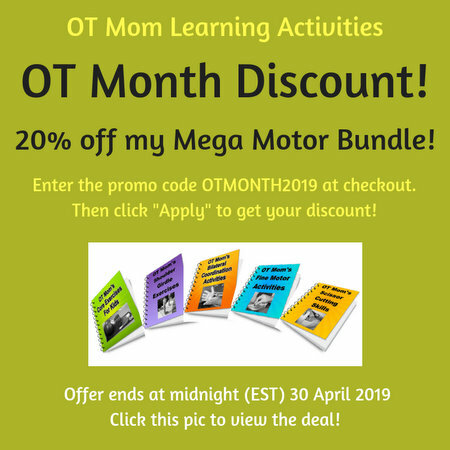 The information on this page is not intended to take the place of an occupational therapy evaluation and treatment! Playing with a ball can be good for developing bilateral integration, but if your kiddo keeps missing the ball, it can get pretty tedious! Here is a great way to help your child practice ball skills without chasing after missed balls all day long: suspend a ball in a net as shown in the photos below, and use it to practice ball skills. I used a tennis ball in these pics, but larger balls are also good, especially for younger kids. I use a net bag, the kind that you get fruit and veggies in. Pop a ball in and knot it to a length of rope. The rope needs to be long enough to get the ball level with your child’s chest. Suspend the ball from any horizontal pole or even from a hook in a doorway. Now your child can use both hands to push the ball away and catch it again. This section contains affiliate links to items similar to the ones I use - I may receive a small commission if you purchase an item through my links. Rolling out dough with a rolling pin is a lovely, symmetrical bilateral activity. 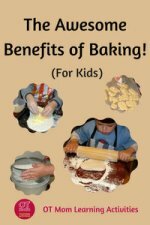 Get your child involved in rolling out cookie dough, bread dough or playdough! Find some maracas or musical shakers (like these ones on Amazon) . Have your child move them in time to music. Try moving them symmetrically (up and down at the same time) or reciprocally (one hand then the other). Getting legs to move together is hard work. Start by having your child jump over a line and back again, one jump at a time. Increase the number of jumps as your child improves at keeping feet together! A Zoom Ball is an awesome toy! Your child needs to open and close the arms symmetrically, to make the ball "zoom" back and forth on the string. One of my favourite bilateral toys! Pulling hand over hand on a rope is a good way to get the hands working rhythmically together. You can often find these rope ramps at local parks and play centres. Have you tried Stretchy Bands like these ones on Amazon? 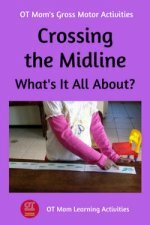 When a group of kids are making the band move around in a circle, hand over hand, they are getting a good bilateral workout, as well as crossing their midlines. 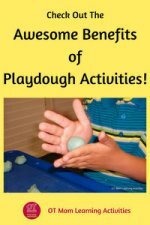 Encourage your child to roll large balls of playdough between two hands to make smooth balls. Try some of my other playdough ideas to boost bilateral coordination skills. Creeping (crawling) is another great reciprocal activity - have your child creep across the floor to collect items you put out, or chase them around the floor yourself! The vestibular system (which is situated in the inner ear and helps the brain to process movement information) plays a vital role in a child's physical development. For this reason, occupational therapists who use sensory integration techniques may include specific movement activities in their therapy sessions to stimulate the vestibular system before carrying out activities to boost bilateral coordination skills. At home, you can give your child's vestibular system a boost by having your child jump on a trampoline, roll on the grass, touch his/her toes, use a swing or do somersaults. 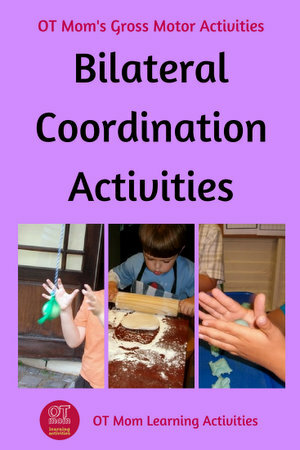 You can do these movement activities before or during the bilateral activities. I have a few ideas for classroom vestibular activities over here. The bilateral integration activities above are just a small sample of what I have put in my e-book. 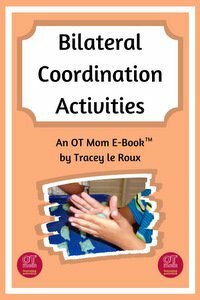 Check it out if you are looking for lots more activities to do at home with your child! Lots of photos and really practical ideas to make it easy for parents to work on these skills. All for just $5, the price of a couple of coffees! I hope you found these activities helpful! For your convenience, I have linked to similar products on Amazon - I may receive a small commission if you purchase something through these links, which helps support this site. However, you are under no obligation to purchase anything!